Dimensions: 11.8" x 8.5" x 1"
Sectional tray for toddlers +. I have given this twice as baby shower gifts and will buy more. My 18 month old niece enjoys hers. It is not flimsy and is easy to wrap and mail. My grandson loved it!! A winner! Once upon a time there was a child who would not finish dinner . 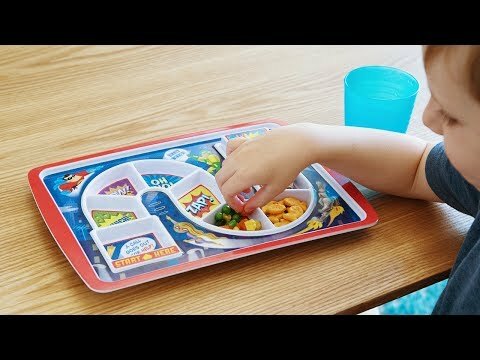 . . until his parents wised up and got him this toddler dinner tray. 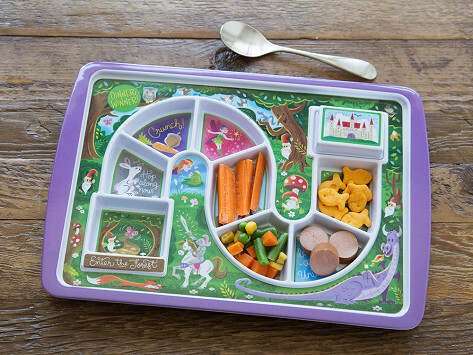 Kids will stay happily at the table—and, more importantly, finish their meal—with this board-game-meets-plate. Charming, storybook-inspired scenes lead little diners along a path of compartments. Each bite brings them closer to the final spot, which can be uncovered to reveal any number of bribes—um, we mean, rewards—for a completed meal, like dessert or a small toy. The sturdy plates are made from durable melamine that is BPA-free and food- and dishwasher-safe, too, so parents will be just as happy as their now-full kids.